There isn’t a great deal that parents can do to make headteachers change their mind about permanent exclusion. I used to believe that if you could show “someone” that the school hadn’t tried everything before the permanent exclusion, then it wouldn’t stand. That’s just not the case. I also used to think that “someone” could MAKE the school put support in place, but that turns out not to be true either. This applies equally to maintained schools as to academies. It’s extremely difficult for parents to find a school place for young people once GCSEs have started. Add exclusion to the child’s school record and it becomes virtually impossible, even where there is a local agreement that schools will take their share of hard-to-place pupils. The appeal system changed in 2012 and parents now take their case to an Independent Review Panel (IRP) instead of an Appeal Panel. As explained in the Government’s Exclusion Guidance, there are possible outcomes from an Independent Review Panel: it can uphold the exclusion decision; recommend that the governing body reconsiders their decision, or quash the decision and direct that the governing body considers the exclusion again. The governing body must comply with any direction of the panel to place a note on the pupil’s educational record. 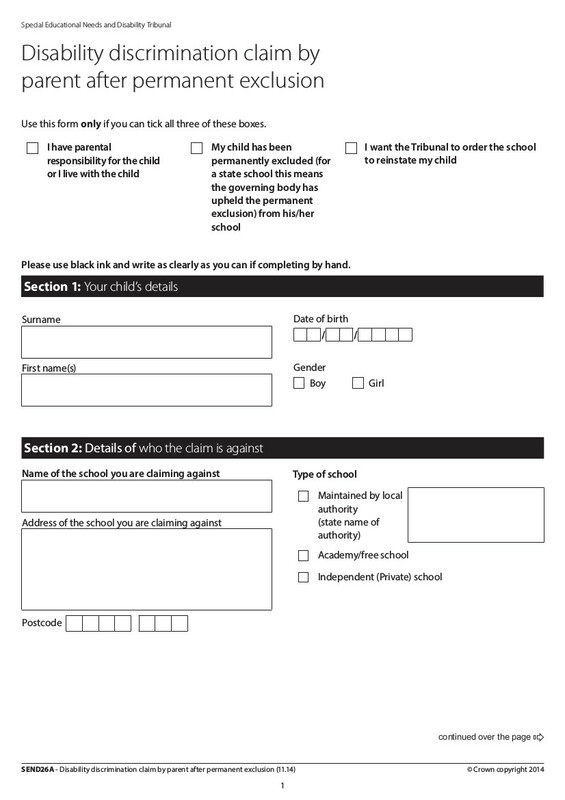 This includes noting that, where a pupil is not reinstated following a direction to reconsider, the exclusion does not count towards the rule that an admission authority may refuse to admit a child who has been excluded twice; or in the case of a community or voluntary controlled school, the governing body may appeal against the decision of the local authority as the admission authority to admit the child. In other words, the exclusion will still show and will still apply but the record will indicate that the school was formally directed to reconsider the head’s decision, suggesting some flaw in the process leading to the decision. Parents’ sense of injustice meant that a number of parents did not necessarily appeal in order to get their child’s place back at the school. In many cases the relationship had broken down, or time had moved on. Many expressed a wish for the removal of the exclusion from their child’s record, although this is not a direct outcome of an IRP, and others wanted what they perceived as justice, i.e. for the school to be told, and accept, they had not done all they could for the pupil. In fact, a minority of parents were aiming for their child to be reinstated – at least by this stage of the process where another school may have been found, or the relationship with the school felt irrevocably broken. Schools themselves found it hard to understand these perspectives. From many headteachers’ viewpoints, the purpose of the appeal was to get a child reinstated and some felt that it was not a valid use of resource to have to go through an appeal process where this either was not likely to happen, or was not even an outcome the parents wished for. Even where a school DOES take a child back, there is nothing to say that support or adjustments now have to put in place or that the pupil has to be welcomed or reintegrated at all. For example, the Communities Empowerment Network recounts how an academy agreed to take a pupil back after the exclusion decision was quashed but then directed the student immediately to off-site provision. It’s important to be aware that Review Panels aren’t the only way to try and reverse a permanent exclusion. you know, without the experience or the understanding of what the process is about you can find that they are arguing about something for half an hour which is really not that important in the scheme of things and they are missing a huge point which maybe they should be challenging the school on. Parents may feel there isn’t much point complaining to the School Governors about exclusion because the governing body will always back up the headteacher, but in fact, it is ONLY the governing body which can make the head reconsider the exclusion, not any subsequent Panel, although we don’t know how many exclusions are discussed at governors’ meetings or the percentage of decisions either way. The Department does not collect information on permanent exclusions which were overturned at the governing body consideration stage and at governing body reconsideration stage. Those do not count as exclusions and the exclusion decision has effectively been overturned. Parents are given the opportunity to request an SEN expert to be present at an Independent Review Panel regardless of whether or not their child has identified special educational needs. You can read some feedback from parents about SEN experts here. It should be borne in mind though that the Panel won’t be looking at whether the decision was “fair” or asking whether the school could have made more accommodation for the child’s SEN, but whether the school has followed the law. the end of it to be told ‘Oh well, he did breach the discipline policy’. It’s, it’s just ridiculous. Ipsea provides useful information sheets about exclusion and SEN although they don’t cover taking an exclusion case to tribunal on the grounds of disability discrimination. The School Exclusion Projec has more information about Special Needs Tribunals. When there is an element of Special Educational Needs involved with a child a school has a duty to make reasonable adjustments to procedures in place to allow for that child’s education. This can include such matters as disregarding behaviour in direct consequence of their disability. What is vital is to distinguish is if the decision to exclude a disabled pupil for behaviour which arises as a consequence of their disability is unlawful disability discrimination unless the choice to exclude was a proportionate means of achieving a legitimate ends. Proportionate means it was the least extreme option available. School to issue a written apology. School to reinstate the child. Permanent exclusion to be removed from the child’s school records. School to modify its behaviour policy. School to issue a declaration of discrimination. School to provide training to school staff. School to draw up new guidance for staff. School to provide extra tuition to make up for lost learning. Just over a quarter of parents interviewed said that they were aware of the two different routes, but at the time had seen the FTT as ‘the next stage’ or a last resort, something that they would have considered if they did not get the desired outcome from the IRP. This was due to the time deadlines of the IRP, often making it more pressing to complete first (an IRP application needs to be made within 15 days of an exclusion, whilst a FTT can be made up to 6 months after. Somewhat confusingly, there are 4 possible forms, one set for parents and the other for young people. In each set there is a general disability discrimination form AND an expedited or fast track permanent exclusion discrimination form. If the courts change where they put the forms on their site again – which happens regularly – you will need to check that you have the expedited form which says at the top of page 1 that reinstatement is an option. Just to flag up in case anyone else is similarly confused, it seems that the previous SEND4 parents’ guide to disability discrimination now includes information for young people making their own claims, and is listed under young people here via this page. The powers and duties of the IRP are set out in section 51A of the Education Act 2002, as amended by section 4 of the Education Act 2011. 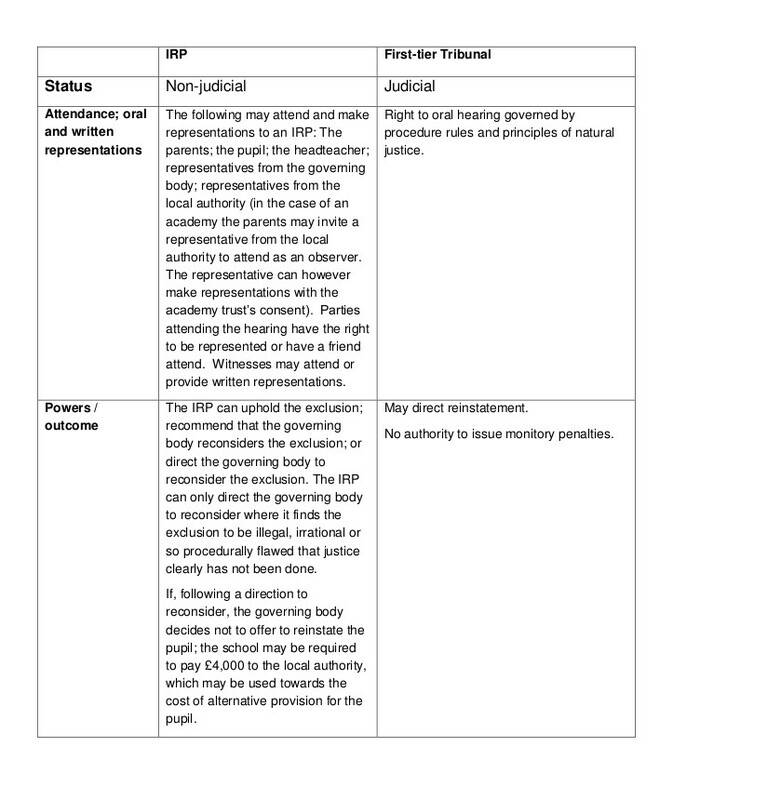 After a child has been permanently excluded, the options are Governors’ Meeting, Independent Review Panel, and First Tier Tribunal (in cases of disability discrimination) The governors – as the responsible body – are able to overturn the head’s decision to exclude but the panel can’t do this. Nor can an IRP get the exclusion “struck off” the child’s record. The deadline for the panel is much earlier than for the tribunal but parents don’t have to wait for the panel before starting with the tribunal. 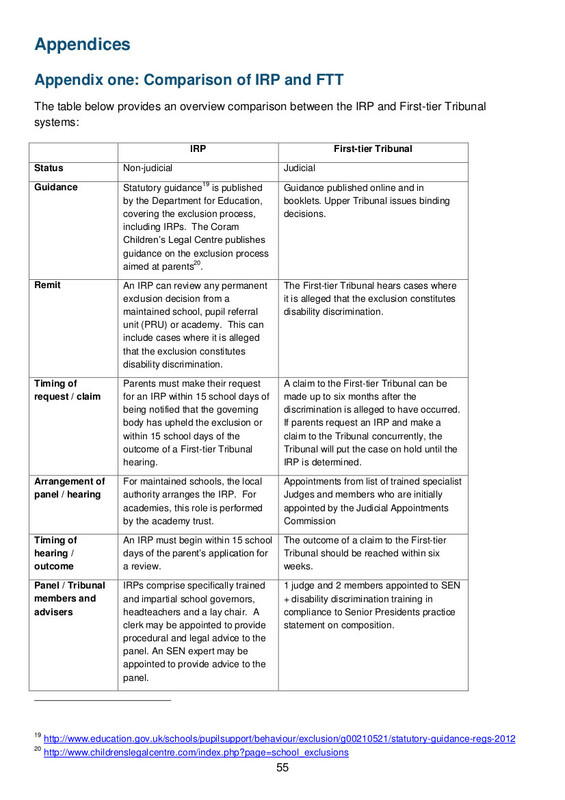 The tribunal can direct that the exclusion is taken off the child’s record and can order the school to take the child back, but the legal test as to whether there has in fact been “disability discrimination” is very narrow and parents are strongly recommended to seek legal advice.